The first touchdown scored in the College Football Playoff national championship came with 12 seconds left in the first half. Georgia capped off a nine-play, 69-yard drive with a one-yard touchdown run from wide receiver Mecole Hardman on a direct snap. Georgia quarterback Jake Fromm motioned out wide, while Hardman took the direct snap. He faked the handoff to running back Sony Michel, then kept it himself, running to his left for a one-yard touchdown, giving the Bulldogs a 13-0 lead, following the PAT. 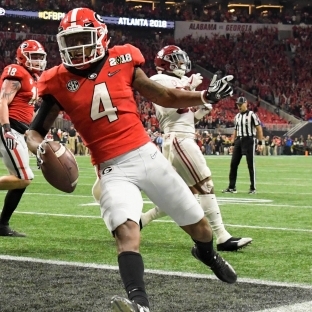 Georgia finished the first half with 223 yards of offense, compared to Alabama’s 94 yards. Watch Hardman’s touchdown run below.